This rocker was made from cherry with African Purple Heart on the back spindles, inlayed into the runners, wrapped around the joints and for the plugs. An ottoman was made for this rocker also out of cherry with purple heart incorporated into it as well. The combination of the cherry and purple heart came out surprisingly beautiful. The purple heart really popped out against the lighter contrast of the cherry. Especially when wrapped around the joints, where the seat and legs meet. 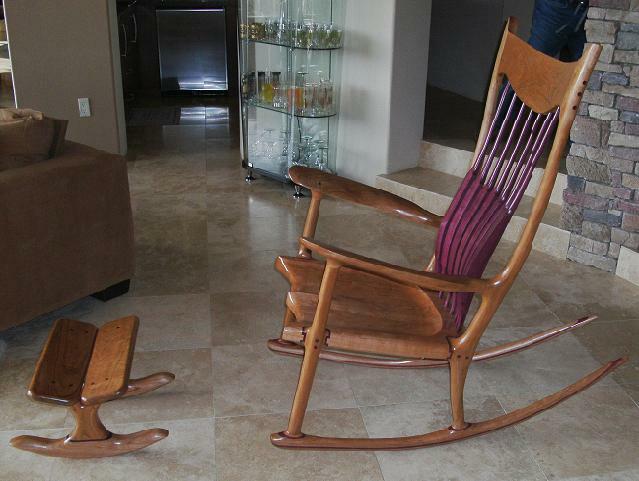 We delivered this rocker to the Palm Springs area, but its permanent home will be in the Lake Arrowhead area. If you wish to see some of the construction photos of this rocker, please see the Cherry Rocker Construction photos page. 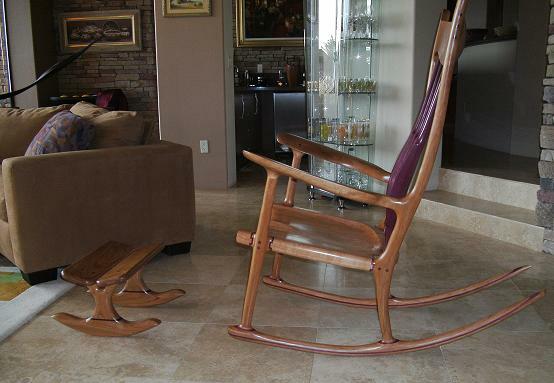 Check out our Walnut w/Curly Cherry rocker showing some of our new design details. You are currently browsing the Shangrilawoodworks's Blog blog archives for February, 2010.